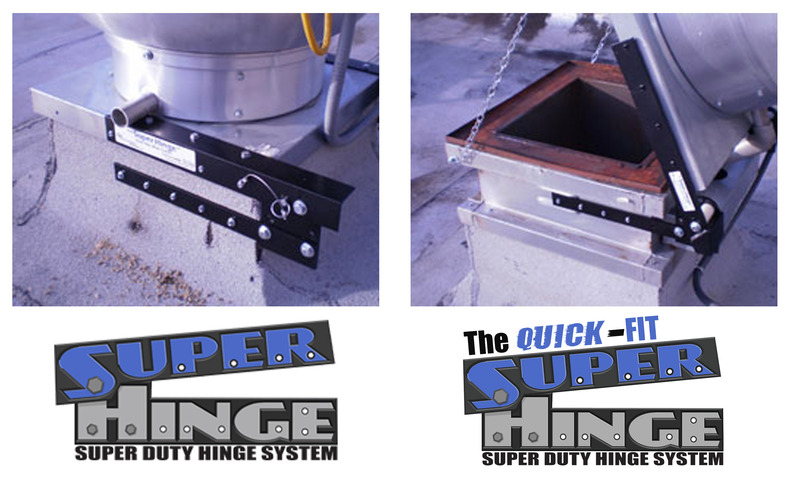 Super Hinge changes the way exhaust fans are hinged for cleaning and maintenance. The Super Hinge's patented technology allows for ease, convenience, versatility and durability, and helps increase the life of the expensive fan housing by adding support to prone failure areas of the fan base. Laser cut heavy gauge powder coated steel components eliminate the repetitive flexing stress that occurs to fan base during use and service. Corrosion proof hardware is provided to ensure that the Super Hinge stays firmly attached to the fan and duct. The Super Hinge is available in two versions: The "Super Hinge"and the "Quick-Fit Super Hinge". We also offer the Econo Hinge and the Quick Fit EZ Clean Hinge. The Super Hinges are the most durable on the market. If you're installing a new fan, and want to extend the life of the fan, Super Hinges are the recommended option. The Quick Fit Super Hinge is the same as the Super hinge except easier to install and not available for oversized fans (over 45 inch fan base), and they can be installed by oner person while the fan is running in less than 15 minutes. We typically recommend the Quick Fit unless the fan base is larger than 45 inches. In order to provide effective support and to safely hinge an exhaust fan using any Super Hinge exhaust fan hinging system, we highly recommend that you choose a model which supports anywhere from 2/3 to the entire fan base. So, simply measure the length of your fan base and multiple by .66 to find the minimum legnth of coverage needed. Please see the details of each product for sizing specs. By following the sizing guildines, you not only ensure safe support of the thin material of the fan base, you also eliminate flexing and bending of the fan base which can compromise the seal between the bottom of the fan and the duct it is mounted to. Failure to do so greatly increases the risk of damaged fan bases, inefficient exhaust draw due to vacuum leaks, grease seepage and personal injury due to fan base or hinging failure.